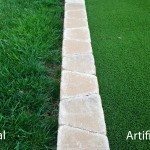 What is artificial grass? 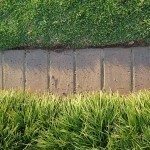 It’s a great way to maintain a healthy looking lawn without watering. With a one-time installation, you avoid all the future costs and hassles of irrigation and weeding. And you get the guarantee that your lawn will look good no matter what. Keep reading for more information on installing artificial grass. The first thing you want is a clear, level area. Remove any existing grass or vegetation, as well as 3-4 inches of topsoil. Pry out any rocks you may find, and remove or cap any sprinkler heads in the area. Apply a base layer of ?” of crushed stone for lasting stability. Compact and smooth your base layer with a vibrating plate or roller. Give the area a slight grade, sloping away from your house to improve drainage. Next, spray a weed killer and roll out a fabric weed barrier. Now your area is ready for artificial lawn installation. Make sure the area is completely dry before your proceed. Now it’s time for installing. Artificial grass is usually sold and delivered in rolls. Unroll your grass and leave it flat on the ground for at least two hours, or overnight. This acclimation process allows the turf to settle and prevents future creasing. It also makes it easier to bend and work with. Once acclimated, position it in roughly the layout you want, leaving a few inches of leeway on each side. You will notice a grain to the turf – make sure it’s flowing in the same direction on each piece. This will make the seams less noticeable. You should also point the grain so it’s flowing in the direction most often viewed, as this is the direction it looks best from. Once you’re satisfied with placement, start securing the turf with nails or landscape staples. In places where two sheets of turf overlap, cut them so that they meet flush with each other. Then fold both sides back and lay down a strip of seaming material along the space where they meet. Apply a weather resistant adhesive to the material, and fold the turf sections back over it. Secure both sides with nails or staples. Cut the edges of the turf to the shape you want. To keep the turf in place, lay a decorative border around the outside or secure it with stakes every 12 inches. Finally, fill the turf to give it weight and keep the blades upright. Using a drop spreader, deposit the in-fill of your choice evenly over the area until no more than ½” to ¾” of grass is visible. Spray the whole area with water to settle the in-fill.